Tennessee Volunteers forward Jeronne Maymon (34) and Tennessee Volunteers forward Jarnell Stokes (5) react with the bench against the Mercer Bears during the first half of a men's college basketball game during the third round of the 2014 NCAA Tournament at PNC Arena. INDIANAPOLIS — Dayton’s run to the Elite Eight has been one of the great stories of the NCAA tournament. Another great story started in Dayton at the First Four. The latest team to come out of the at-large play-in games at the First Four at the University of Dayton Arena is Tennessee, which plays Michigan tonight in the Sweet 16. The Vols won the No. 11 seed in the Midwest by defeating Iowa in Dayton, then beat UMass and Mercer last weekend. The First Four game was just nine days ago. It seems like 90. 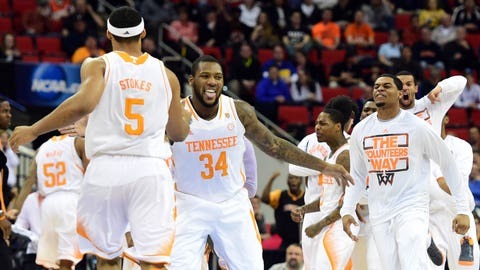 "I feel like I was somewhat disappointed having to play in the First Four," said Jarnell Stokes, Tennessee’s best player through this tournament run. "I felt like we were a better seed than what they gave us. And the (TV) cameras were in our face and I couldn’t even get up and cheer (during the selection show). "But I knew if we got past the first game we were going to have momentum going into the second game, and that’s exactly what happened." In 2011, the first year of the First Four, VCU blew out USC in Dayton and went all the way to the Final Four. South Florida won in Dayton in 2012, then won again before being eliminated by Ohio University. LaSalle went from Dayton to the Sweet 16 last year in Los Angeles before losing to Wichita State. The extra game has been a momentum builder. Tennessee (24-12) has won eight of nine games dating back to late February with the only loss during that span coming to Florida in the SEC tournament. "The biggest thing for us (is) we were happy to play in a NCAA tournament," Tennessee coach Cuonzo Martin said. "I’m not sure, maybe I’m clueless on (what) people say about the First Four. It’s the NCAA tournament. That’s the most important thing. "Tennessee is in the NCAA Tournament, and that’s all I was consumed with. I was happy to be in it. Our guys were happy playing in it. We are ready to play basketball. We were very grateful for the opportunity and I think that’s why our guys are playing fun, playing for fun, playing together and enjoying the process." With Stokes and Jeronne Maymon — both are listed at 6’8, 260 — leading the way, the Volunteers are throwing the ball inside and getting positive results. Stokes is averaging 20 points and 15 rebounds in the NCAA tournament. Jordan McRae, the Vols’ leading scorer on the season, has two 20-point games in the tournament. "I think (having to win a play-in game) was great motivation to prove ourselves," McRae said. "I think we’ve been able to do so much in this last stretch. We only lost one game and that’s against the No. 1 team in the country. "We’ve been in so many close games this year. I felt like we’re better than what our record said, because sometimes we just go cold in the last two or three minutes. And we just haven’t been able to pull out games. But I think now we’re figuring it out."